The need for precise land divisions and measurements encouraged field surveying to progress over the years. The Spectra Ranger 3XC Data Collector is a handheld surveying tool designed to gather accurate land data even under the most extreme weather conditions. It features an integrated GPS, Windows operating system, camera, ergonomic keypad, and military-grade durability that help obtain precise measurements of coordinates, distances, angles, and topographic elevations. This device is easy to use even for non-professionals and an essential accessory for any total stations. A data collector is an electronic device that records precise measurements of coordinates, angles, distances, elevations and more. Considered as a handheld field computer, it is portable, battery operated and equipped with a microprocessor, on-board memory for data storage and wireless features for data transfer and connecting to other devices. It has a built-in keypad, LCD display, field software and can be used as a stand-alone device or in conjunction with total stations and PCs for viewing, analyzing and manipulating survey data. This advanced surveying tool increases efficiency and productivity in plotting land boundaries, turnout maps, providing legal land titles, carrying out urban planning and assisting in property development. The Spectra Ranger 3XC features a large color touch-screen display that can be viewed easily in sunlight and is illuminated for easy use even in low lighting. It also has a full alphanumeric keypad allowing you to input numbers, letters or symbols easily. This surveying field data collector has an integrated GPS receiver for accurate positioning information, WWAN (Wireless Wide-Area Network) capability for sending text messages and accessing the Internet via cellphone networks and a customized 5-megapixel camera with LED flash that includes geotagging through Microsoft pictures & videos software. Geotagging is the addition of a current geographic location to the image or video using this device’s integrated GPS receiver, which helps you find a variety of location-specific information efficiently. Its integrated Wi-Fi and Bluetooth capability eliminates the hassle of cable wires and speeds up setup process with other field instruments and computers. 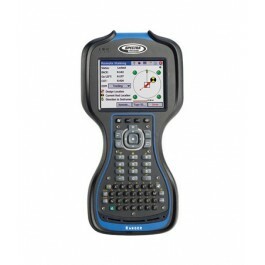 This advanced survey instrument comes standard with a high-speed 800 MHz processor and 256 MB RAM for running large applications with ease and 8 GB of onboard memory for storing data. It also has an accelerometer that automatically rotates the graphics on the screen based on the device’s angle and an integrated compass that determines accurate direction even while you are standing still. In addition, it has USB and 9-pin serial ports and high-capacity SD card slot for synchronizing data easily to a PC. Following the worldwide industry standard for PDAs, this portable data collector is powered by Windows Mobile 6.5 Professional operating system. This OS enables you to run specialized mobile version of all your favorite programs including Internet Explorer, Word, Excel, PowerPoint, Outlook and Media Player. You can also view PDF files easily with Adobe Reader and configure the advanced features of the Ranger’s integrated GPS with SatViewer. SatViewer works by communicating with the GPS receiver to compute your current position, speed, direction and height. Manage your survey data effectively with the reliable Spectra Survey Standard. This on-board data collection software package for surveyors is loaded with a comprehensive set of tools for data collection, calculations, mapping, data storage, data management and data transfer to your laptop or PC. As a veteran in survey software development, Spectra Precision’s Survey Standard incorporates improvements based on actual field experiences to suit all your project needs. It also provides easy-to-navigate intuitive operation and a customizable home screen so you can quickly learn to operate the system via familiar options, menus and commands. This user-friendly graphical field software aids in the operation of the Spectra Ranger and the collection of data by professionals and non-professionals alike in their chosen language. In some areas or regions, weather might have a significant effect on the surveyor’s ability to perform his job and keep data secure. The Ranger 3XC keeps your data safe with its rugged construction that complies with military standard for drops, vibration, humidity and extreme temperatures. This means you can use this field controller in the harshest worksite conditions, such as blazing heat, subzero cold, driving rain or dusty job sites. This device is so durable that it can even withstand 26 drops from 4 feet high onto plywood-over-concrete floors! In addition, with its IP-67 rating, it can survive sand or dust for at least 8 hours of operation and immersion in up to 3.3 feet of water for 30 minutes. Eliminate downtime due to battery drain with the ultra-long-life rechargeable battery of the Spectra Ranger 3XC Data Collector. This handheld surveying tool has a 2600 mAh Li-Ion battery that provides up to 30 hours of power on a single charge. It is also easily removable and replaceable, so you can take full advantage of this device’s functionality even when you are in the field. You can customize this land surveying data collector by selecting your desired software from the drop down menu in the upper right hand corner of this page. All packages come with a nylon carry case, two stylus pens, stylus cord, USB cable, audio port dust cover, I/O port dust covers, hand strap, two screen protectors, rechargeable Li-Ion batteries, AC international charger, and 1-year manufacturer’s warranty. For added versatility, the on-board data collector software for the Spectra Ranger 3XC is offered in five different variations. You can choose the one that works best for you and then easily add features as you need them later on. This helps you save money by getting only the software that you currently need and upgrading to a higher version as your project or business expands. The different modules of Survey Pro are readily available and easy to remotely install via electronic “unlock” codes. Every part of the Spectra Ranger 3RC Data Collector, from the hardware to the software, is designed to work together to give you the most accurate survey data. Seamlessly transfer files with its integrated Bluetooth, Wi-Fi, WWAN, and SD card slot. With an integrated GPS and 5-megapixel camera, it allows you to collect much more relevant field data. This topographic field data collector delivers optimal precision and accurate measurements in every survey job.